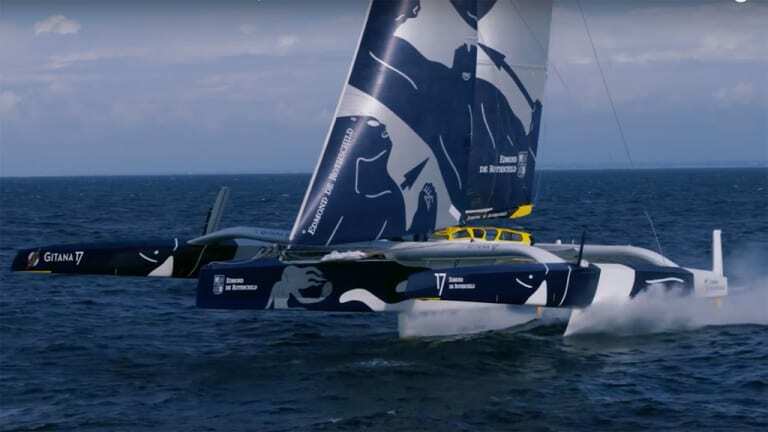 Back in its July issue, SAIL reported on the pending launch of Sebastien Josse’s new Team Gitana maxi Edmond de Rothschild and the fact that it was being designed to achieve full-foiling flight, much like an America’s Cup catamaran. Well, now the boat has not only been launched, but taken to the air as advertised. Last spring, Josse, who plans to sail the boat solo round the world as part of the Brest Ultime Challenge, said that his “flight plan” was a fairly conservative one and that the boat’s airborne capabilities would only be used “tactically.” However, watching these early fully-crewed trial runs, you can’t help but wonder if he isn’t going to spend as much time over the water as on it.